Looptate Games - Welcome to Bridgetate Games! 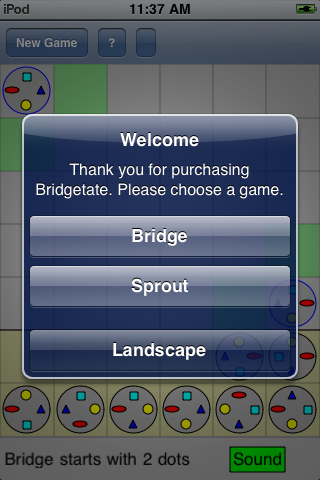 The Bridgetate comes with three fun games: Bridge, Sprout, and Landscape. The Bridgetate comes with three fun games: Bridge, Sprout, and Landscape. The 3 games involve moving dots. There are 4 shapes inside each dot: a yellow circle, a cyan square, a red oval, and a blue triangle. Two dots are "linked" when the shapes on dots' adjacent sides are the same. The goal of the games is to link all of the dots together. Each game starts with a variable number of initial dots. The Bridge game can be played with two, four, or six initial dots. The Sprout and Landscape games can each be played with one, three, or seven initial dots. 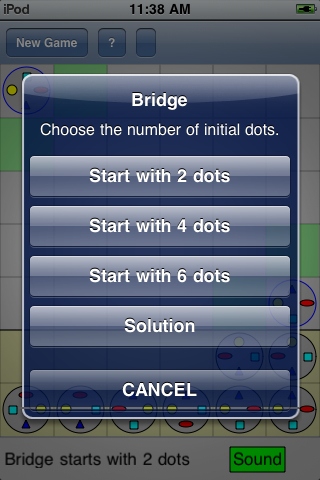 In the Bridge game, the player needs to connect all available dots to the initial dots to form a bridge. 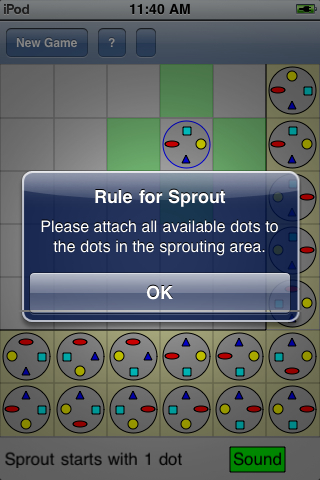 In the Sprout game, the player will attach all available dots to the initial dots. 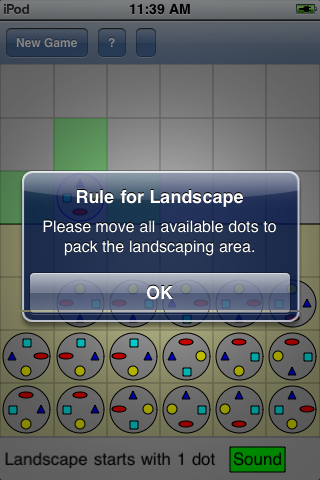 The Landscape game asks the player to use all available dots to tile a rectangular area. 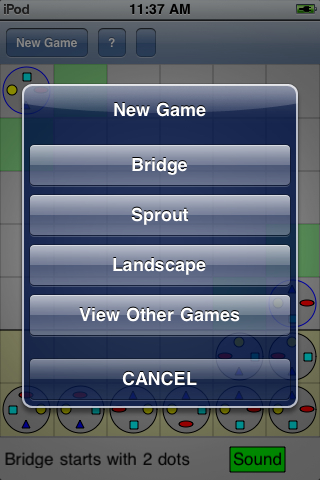 To start a new game, select "Bridge", "Sprout", or "Landscape" from the menu. Each of the three games has three different initial dots set up, which determine the number of initial dots and available dots to be moved in each game. For Bridge, the game can start with 2, 4, or 6 dots. The default set up is "Start with 2 dots". For instance, in Start with 2 dots, you will play with 8 dots and in Start with 4 dots, you will play with 6 dots. 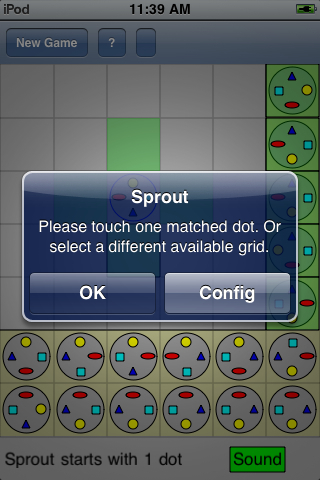 For Sprout, the game can start with 1, 3, or 7 dots. The default set up is "Start with 1 dot". For instance, in Start with 1 dot, you will play with 17 dots and in Start with 4 dots, you will play with 14 dots. The help (?) button will show the player the possible actions he/she can take. Touching the ? button will also reveal the Config button. The player can press the Config button to bring up the Configure window. From the configure window, the player can press the Solution button to see the solution. When you are in Solution mode, a yellow circle with an 'S' will appear in the lower right hand corner. 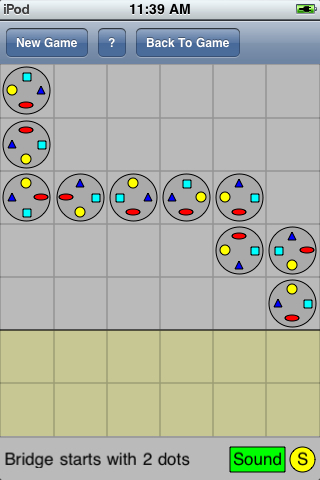 The player needs to move all available dots, which sit on the light yellow area, to build a bridge that links all dots together. The initial dots have the blue circles. The green grids indicate the next possible moves. When the player touches the green grid, this selected green grid will be highlighted with the black outline and all the matched dots for this green grid will be shown with the green background. The player can choose one of these matched dots to fill in this highlighted green grid. 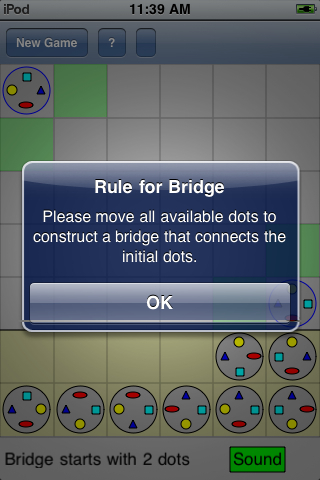 The game will be over when the player successfully moves all the available dots to build a bridge which connects all the dots together. The left figure shows a bridge is successfully built. 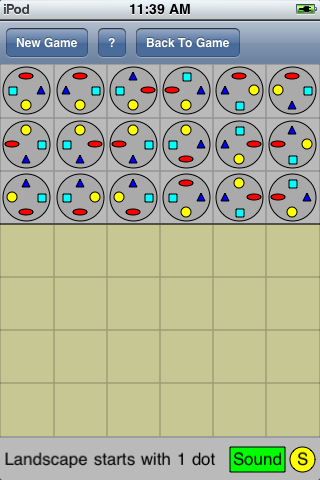 The player needs to move all available dots, which sit on the light yellow area, to attach them to the dots in the sprouting area, which is in the light grey area, to link all the dots together. The initial dots have the blue circles. The green grids indicate the next possible moves. When the player touches the green grid, this selected green grid will be highlighted with the black outline and all the matched dots for this green grid will be shown with the green background. 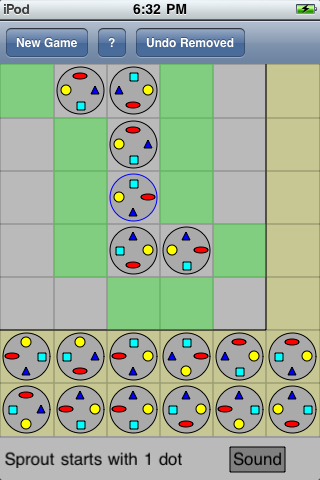 The player can choose one of these matched dots to fill in this highlighted green grid. The game will be over when the player successfully moves all the available dots to connect all the dots together. The left figure shows a sprouting area is successfully built. 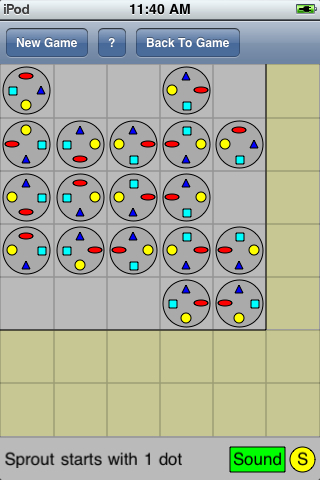 The player needs to move all available dots, which sit on the light yellow area, to pack them to the landscaping area, which is in the light grey area, to link all the dots together. The left figure shows a landscape is successfully built. The Undo Removed button will be available when the player starts to remove the removable dots. The undo sequence is the reversed sequence of the removing dots.